Our Centre – PRORA Zentrum e.V. The Prorer Wiek is one of the most beautiful bays on the island of Rügen. Beyond the beach and the sea, there is much more to discover in Prora: A building complex 4.5 kilometres in length stretches out parallel to the coast between the port of Mukran and the area of Ostseebad Binz. The monumental scale of the building complex still raises questions for visitors today: When and why was the site created? How was it used? What will become of the complex today? Planning of the "seaside resort for 20,000"
The creation of the site dates back to the 1930s. With the election of Adolf Hitler in January 1933 as Chancellor of the Reich, the National Socialists began transforming the Weimar Republic into a dictatorship. One of the strategies to bring people into the National Socialist system was through ostensible social benefits such as was offered by the organisation “Strength Through Joy” (KdF). 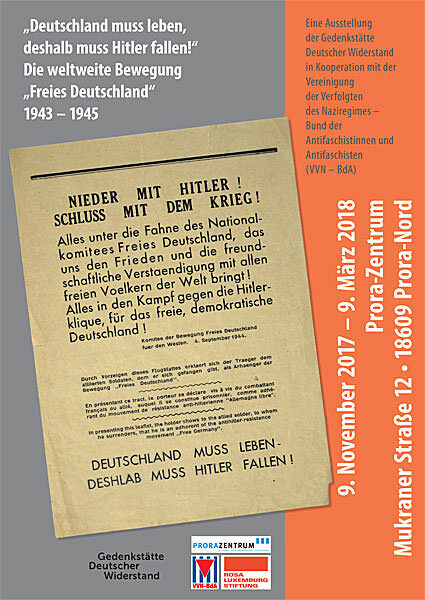 As part of the large organisation the „German Labour Front“ (DAF), KdF was supposed to organise the free time of the members of the so-called „national German community“. Jews, Sinti and Roma, mentally ill and mentally handicapped people, political dissenters, Jehovah’s Witnesses and many more who, according to the National Socialist ideology, did not belong to the „national German community“ were fundamentally excluded from the offerings of the „Strength Through Joy“ organisation.In particular, the sea cruises offered by KdF attracted much attention at a time when a holiday was not necessarily a given. In addition, the National Socialists announced plans to build five huge seaside resorts on the German Baltic Sea coast – the site in Prora is the unfinished prototype of this project. Using the title „Strength through joy – seaside resort Rügen“, the architect Clemens Klotz designed a holiday complex for 20,000 people in 1936 as part of an architectural competition, of which seven of the original eight accommodation houses (now called blocks) still exist today. Klotz’s design included much more than just the accommodation houses. 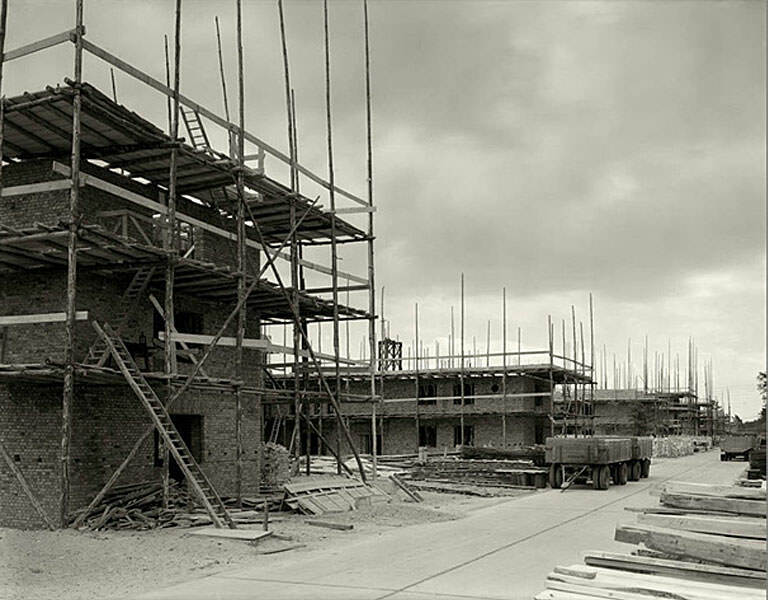 For example, settlements for the Reich Labour Service, staff houses, swimming pools, a plant nursery, a bakery and much more were planned. The laying of the foundation stone for the site took place on May 2, 1936. Two settlements for the Reich Labour Service and two staff houses were completed before the construction of the accommodation houses. Only a part of the planned site could be realised before the invasion of Poland by German troops and the beginning of World War II on September 1, 1939, and eight accommodation houses had not gotten beyond the shell state. The beginning of the war marked the sudden stop to building in Prora; people and materials were withdrawn for important wartime construction projects. Despite being one of the celebrated propaganda prestige projects, the so-called „seaside resort for 20,000“ never hosted a single holidaymaker during the time of the National Socialists. Prora was also used as a military training location beginning in early 1940. Several police battalions received basic training in the two completed Reich Labour Service settlements and in various barracks. Police battalions, the police on external deployment, were used behind the front during World War II. They deported Jews to concentration camps and were also involved in massive war crimes (including in the Baltic States). Beginning in 1942/43 and continuing until the end of the war, the Reich Labour Service settlements became a training centre for naval intelligence workers, who received their 4 to 6 week basic training in Prora. After the Red Army occupied the island of Rügen in 1945 and it became part of the Soviet occupation zone, the major construction site became a warehouse for materials. The southernmost block of the site was demolished during this time period. The beginning of the Cold War and rearmament in East and West Germany ultimately made Prora interesting for the build up of a new East German military kept under wraps. After the October 1949 founding of the German Democratic Republic (GDR), from 1952 onward five of the seven blocks were expanded by members of the Barracked People’s Police (Kasernierte Volkspolizei, KVP) and civil construction companies. Beginning in the 1950s, the southernmost block became a holiday home for military personnel and their families. A large barracks was built in the other four blocks, which was used by the ground forces of the newly formed National People’s Army beginning in 1956 (NVA). Between 10,000 and 12,000 soldiers were stationed at this location. In addition to the site of the planned seaside resort, in 1953 the military seized a large area surrounding the complex between the Klein Jasmunder Bodden body of water and the Baltic Sea, which was later used as a military training area and as such was largely inaccessible to the civilian population. Beginning in the late 1960s, Prora was gradually converted to a training site and the operational units of the military ground forces gradually left the site. Two large training institutions were created with the Technical Noncommissioned Officer School (TUS), and later the Military Technical School (MTS) and the Otto Winzer Officer School, at which foreign soldiers were trained to become officers from 1980 onward. Paratroopers were stationed in block 5, the northernmost of the developed blocks, until 1982. These paratroopers used the two northernmost shell construction buildings (blocks 6 and 7) as military training grounds. After the withdrawal of the paratroopers in 1982, several hundred construction soldiers, the conscientious objectors of the GDR, were stationed in block 5. In the GDR beginning in 1964, it was possible to do unarmed service within the military, hence construction soldier duty. However, this service was not the civilian alternative service as it existed in the Federal Republic of Germany and as was demanded by the conscientious objectors. For the GDR leaders, the conscientious objectors were a thorn in their side. 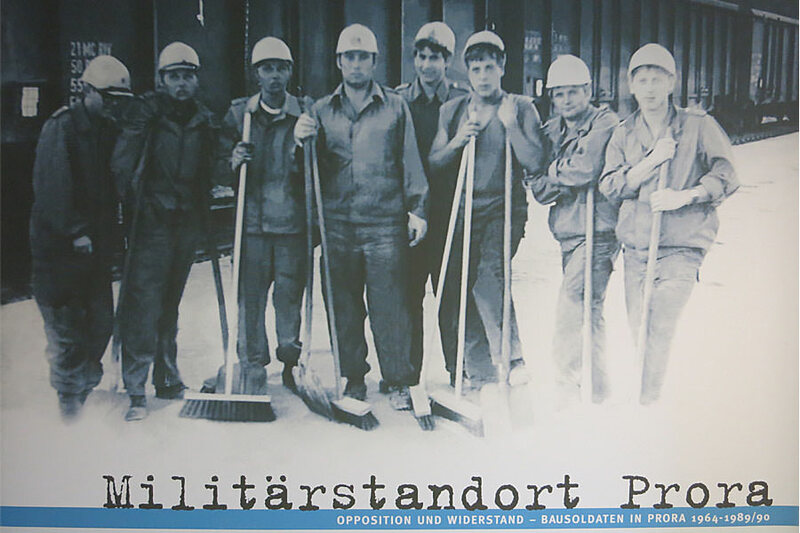 The Socialist Unity Party (SED) saw the construction soldiers as general enemies of the state because they did not want to defend the „peace and socialism“ of the GDR. Many construction soldiers refused to serve in the military for religious reasons, others had pacifist views or political reasons. In the GDR between 1964 and 1989 a total of about 15,000 to 17,000 young men completed construction soldier service, which corresponds to about one percent in any given year. The decision to be a conscientious objector often had consequences later in life, and career opportunities were, in large part, severely curtailed. The construction soldiers in Prora were used mainly in the construction of the Mukran port from 1982 onward, and here they often had to do hard physical labour. Many construction soldiers were especially involved with the peace movement. Thus, they had an important role in opposing the GDR and were involved in the success of the Peaceful Revolution of 1989/90. In many cases, the networks formed during the time of military service remained intact later on. 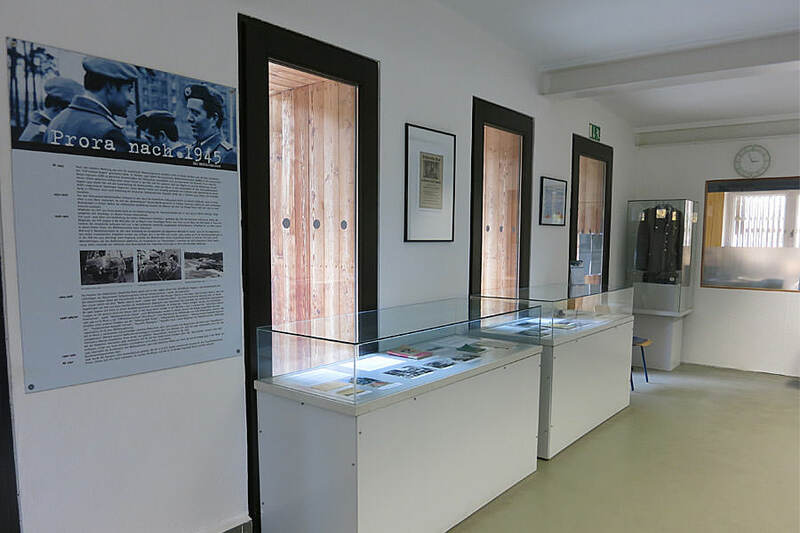 The history of the construction soldiers is documented at the PRORA CENTRE in the permanent exhibition entitled „Opposition and Resistance – Construction Soldiers in Prora 1964-1989/90“ [Link]. Through cooperation with the Construction Soldiers Sponsoring Society Prora e.V., as well as with other groups, the construction soldiers are ready to expand on the already existent three “time fragments” exhibits in the context of an additional outdoor exhibition at the PRORA Centre [Link]. These serve as reminders of the conscientious objectors and their commitment, as well as to elucidate the Prora military base. After the unification treaty between the two German states on October 3, 1990, the federal armed forces took over the location. In 1992 the military base was dissolved and handed over to the Federal Property Office, which then became responsible for the management of the site. On October 12, 1992, the entire complex, including the ruins, was listed as a historical monument. The demolition of the building was thus avoided, but questions regarding its future use remained unanswered. Parts of the building complex were used in the interim, often for cultural or tourist purposes. In the north part, the blocks were empty for a long time. 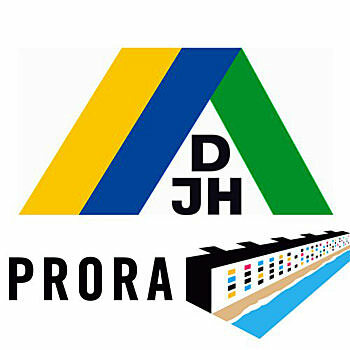 In 1996 the Federal Ministry of Finance commissioned a needs analysis and profitability study for Prora, which was available in 1997 as the development concept „Prora for Rügen“. However, as part of Berlin’s delicate urban renewal plan, this so-called societal „S.T.E.R.N. study“ was never implemented. Instead, the Federal Property Office sold the blocks individually to private investors beginning in 2003. Block 5 was acquired by the administrative district of Rügen in 2006.
of the historic town of Prora to those at the youth campground, and later on to guests staying at the youth hostel. Since its opening in 2011, the Prora Youth Hostel and nearby youth campground have proven to be very popular. Since its beginnings, the youth hostel and campground have been one of PRORA CENTRE’S cooperation partners. In 2016 the new district of Vorpommern Rügen, in existence since 2011, decided to sell block 5 to private investors. The Prora Youth Hostel will remain in the building and be connected to a newly renovated, long-planned education and documentation centre [Link] on the history of Prora, as promised by the local district. 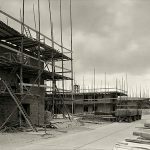 After the Prora Youth Hostel opened, the private proprietors of the remaining blocks also became engaged. In the intervening time, all blocks have been sold and are being extensively renovated. Large parts of the site have been converted into luxury condominiums and hotels, only block 5 is still recognisable from the outside as one of the Prora blocks. Prora’s history will have another chapter added with this renovation, but this historic place is threatened with disappearance. 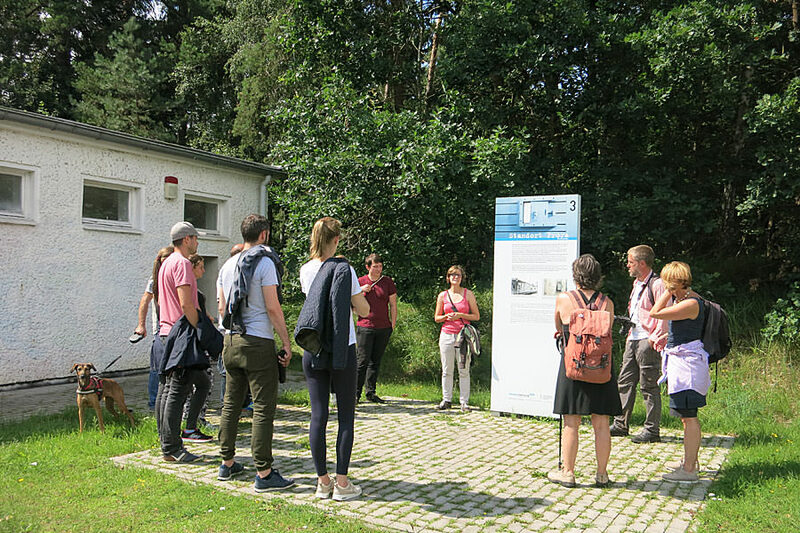 Get a first-hand idea of the site yourself and explore the diverse history of Prora while visiting the PRORA CENTRE! 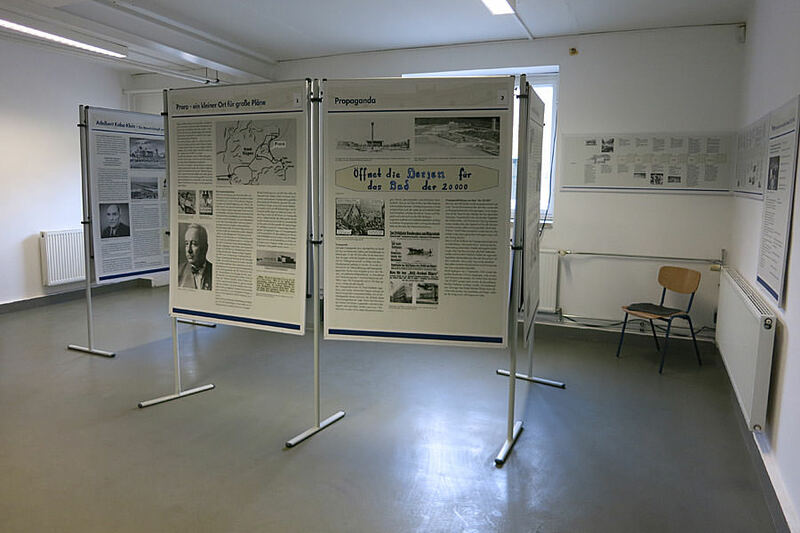 The exhibition entitled “Prora – More than just a pretty beach 1933-1946” was developed as part of a project involving pupils from the Ernst Moritz Arndt High School in Bergen. 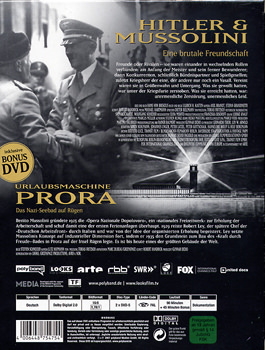 It gives an overview of the origins of the site at Prora during the National Socialist era, as well as the history of its usage during World War II. In addition, the phenomenon of anti-Semitism in spas and the Aryanization of the spa in Binz are discussed. The small exhibition „Prora after 1945“ documents the post-war history of Prora and its transition into one of the largest military bases in the GDR during that period. Light is shed on the development during its nearly 40-year history of use. This exhibition tells the story of the construction soldiers, the conscientious objectors from the GDR who, as part of the National People’s Army (NVA), were stationed in Prora during the period from 1964-1989/90. Starting in 1982, Prora became the largest site for construction soldiers in the GDR. In addition to photos, texts, sheets, files and exhibits, audio and video clips from interviews with former construction soldiers are available. The presentation prepared by the PRORA CENTRE in 2013/14 was based on the research findings of the association. The history of the construction soldiers at Prora was examined through several research and interview projects, thanks to the support of the Federal Foundation for the Reappraisal of the SED Dictatorship and the state commissioner of Mecklenburg Vorpommern in the provision of documents from the State Security Service of the former GDR. 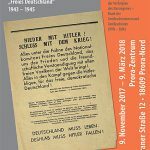 The exhibition documents the activities of German emigres who, while in exile, were engaged in liberating Germany from the National Socialists. 15 short biographies give an insight into the multi-faceted work and commitment of the exiles. Extensive photographic and source materials enrich the documentation. The exhibition shows photographs from the Wim Cox archive in Cologne, which were taken by the photographers Hugo Schmölz and Karl Hugo Schmölz. They accompanied Clemens Klotz, the architect who did the KdF seaside resort, during the planning and construction process and they documented this process. This is the first time that these photos are being shown to the public in this format. 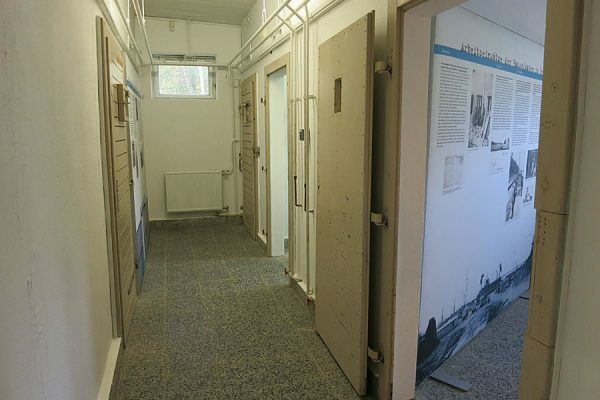 During the presentation period, the PRORA CENTRE will offer guided tours of the photo exhibition. The exhibition will show more the 160 historical photos and documents. In addition, QR codes are integrated to link to internet film documentations. With the addition of these materials, the exhibition becomes a panorama of the Cold War and the global competition of systems that characterised the second half of the 20th century. The history, conditions and implementation of the murder of patients in the National Socialist State will be shown in ten chapters. Ten biographical sketches of the victims of these patient killings illustrate the individual dimension of the crime. 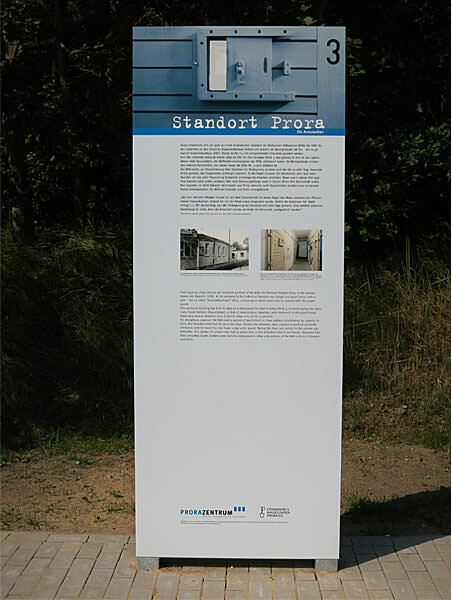 Since 2014, the PRORA CENTRE has been working on an outdoor exhibition in cooperation with the Construction Soldiers Sponsoring Society (Förderkreis Bausoldaten Prora e.V.) entitled “Time fragments”. „Time fragments“ are prominent points on the grounds in Prora, which are intended to commemorate the military use of the site during the GDR period. 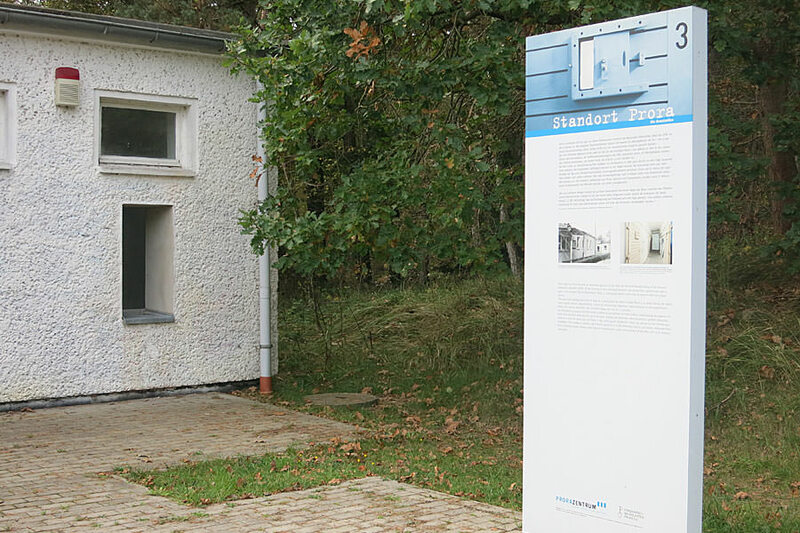 Both associations wish to make these „time fragments“ visible in this area in order to both emphasize the authenticity of the place and create a stronger foundation of GDR history at Prora. Three “time fragments” have been installed so far, with more to follow. 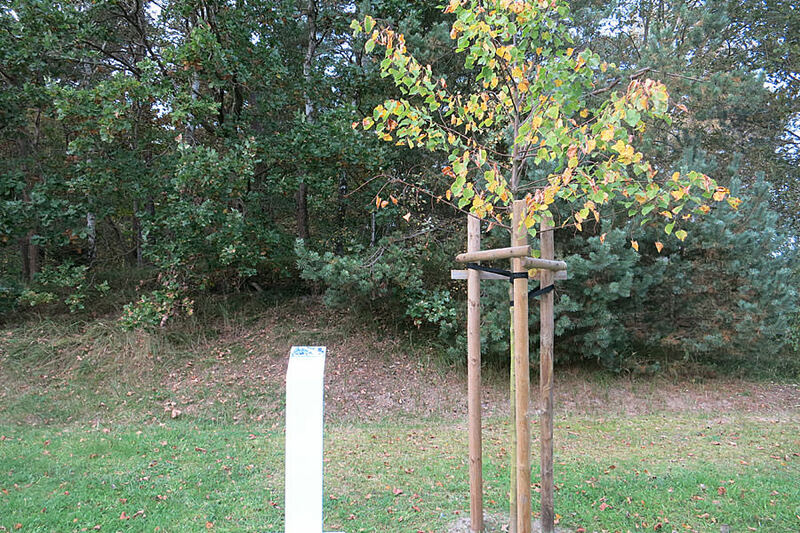 The column with the first time fragment is located next to the present PRORA CENTRE exhibition building at the entrance way to the youth hostel. During the GDR era, this building was the so-called inspection area (KDL), in which there were also several detention cells. The column offers an explanation of the military penal system; a window in the building provides a view of a detention cell preserved in its original state. 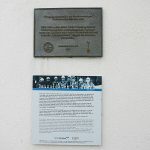 At the former sports hall in block 5 (the current multipurpose hall at the Prora Youth Hostel) a panel was added in 2014. 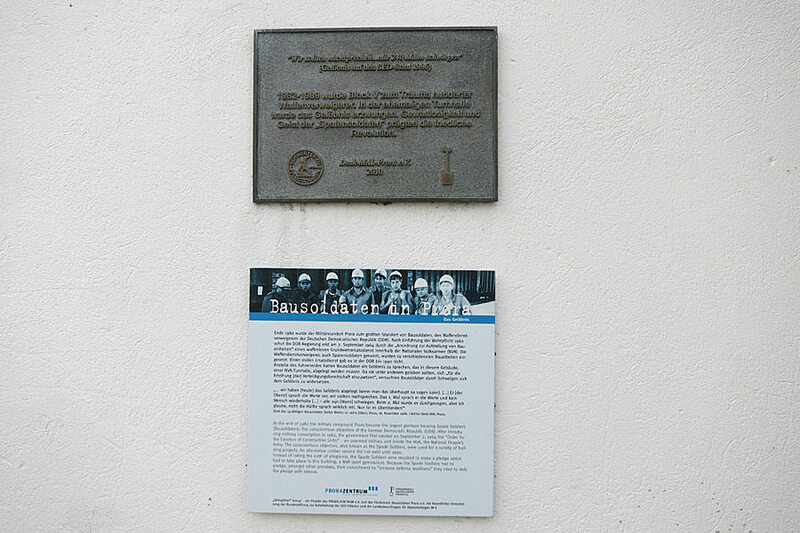 This panel complements a memorial plaque that has been there since 2010, as put up by an old association called DenkMal Prora, and it highlights the history of the construction soldiers in Prora. Both panels serve as reminders that in the 1980s, the construction soldiers had to say their oath, which was different from the usual oath of allegiance done by NVA soldiers. 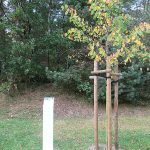 In the green space next to the former inspection area (KDL) of the military section in Prora, where the PRORA CENTRE is located today, a group of former construction soldiers of the 1st construction company in 1985/86 planted a tree of remembrance in October 2016. 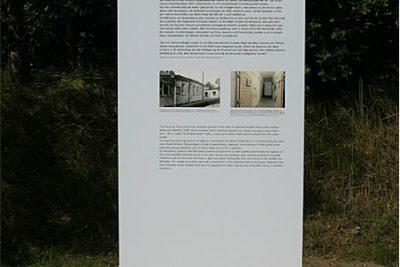 The 45 minute reportage entitled „Prora Holiday Machine“, which sheds light on the plans and background of the „KdF Rügen Seaside“ planned by the National Socialists. The film “Swords to Spades. The Construction Soldiers of the GDR” (35 min.) illuminates the history of the conscientious objectors from the 1960s to the Peaceful Revolution of 1989/90 with the help of various contemporary eyewitness accounts. The film screenings are included in the entrance fee. The building also houses a book shop with Prora related literature, regional history, DVDs and postcards. From May to October, the PRORA CENTRE regularly offers events such as lectures, film screenings and action event days. Panel Discussion "A Distrust of Politics in East Germany - A Legacy of the Cold War Experience?" The PRORA CENTRE cooperates with diverse regional, national and international partners within the working areas of exhibitions, education and research. Construction Soldiers Sponsoring Society Prora e.V. If you have questions or requests, please contact us! Please note: You can revoke the declaration of consent at any time with future effect by sending an email to info@prora-zentrum.de.